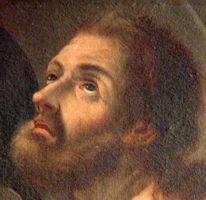 O God, who with untold mercy were pleased to choose as an Apostle Saint Matthew, the tax collector, grant that, sustained by his example and intercession, we may merit to hold firm in following you. Through our Lord Jesus Christ, your Son, who lives and reigns with you in the unity of the Holy Spirit, one God, for ever and ever. At the time that Jesus summoned him to follow Him, Matthew was a publican, that is, a tax-collector for the Romans. His profession was hateful to the Jews because it reminded them of their subjection; the publican, also, was regarded by the pharisees as the typical sinner. St. Matthew is known to us principally as an Evangelist. He was the first to put down in writing our Lord's teaching and the account of His life. His Gospel was written in Aramaic, the language that our Lord Himself spoke. No one was more shunned by the Jews than a publican, who was a Jew working for the Roman enemy by robbing his own people and making a large personal profit. Publicans were not allowed to trade, eat, or even pray with others Jews. One day, while seated at his table of books and money, Jesus looked at Matthew and said two words: "Follow me." This was all that was needed to make Matthew rise, leaving his pieces of silver to follow Christ. His original name, "Levi," in Hebrew signifies "Adhesion" while his new name in Christ, Matthew, means "Gift of God." The only other outstanding mention of Matthew in the Gospels is the dinner party for Christ and His companions to which he invited his fellow tax-collectors. The Jews were surprised to see Jesus with a publican, but Jesus explained that he had come "not to call the just, but sinners." St. Matthew is known to us principally as an Evangelist, with his Gospel being the first in the New Testament. His Gospel was written in Aramaic, the language that our Lord Himself spoke and was written to convince the Jews that their anticipated Messiah had come in the person of Jesus. Not much else is known about Matthew. According to tradition, he preached in Egypt and Ethiopia and further places East. Some legends say he lived until his nineties, dying a peaceful death, others say he died a martyr's death. In the traditional symbolization of the evangelists, based on Ezech. 1:5-10 and Rev. 4:6-7, the image of the winged man is accorded to Matthew because his Gospel begins with the human genealogy of Christ. Patron: Accountants; bankers; bookkeepers; customs officers; security guards; stock brokers; tax collectors; Salerno, Italy. Symbols: Angel holding a pen or inkwell; bag of coins; loose coins; halberd; inkwell; king; lance; man holding money; man holding money box and/or glasses; money bag; money box; purse; spear; sword; winged man; young man; book; man sitting at a desk. Do something for the needy: money for missions, donations of clothing or toys, canned goods drive, etc. Take time to read St. Matthew's Gospel, keeping in mind that St. Matthew depicts the humanity of Christ and emphasizes His physical sufferings. He makes frequent reference to the fulfillment of prophecies because he wrote to Jews and to Jewish Christians. Discuss St. Matthew's call from Christ "Follow me" with your children and how we are all called to belong to the family of God. Pray for people who work for financial institutions. Make Silver Dollar Pancakes, you can use this recipe on Catholic Cuisine's website or one of the suggestions we offer under recipes.